Reports for earlier events, where available, are linked from the ‘medallist’ pages. International Canoes group on Facebook. 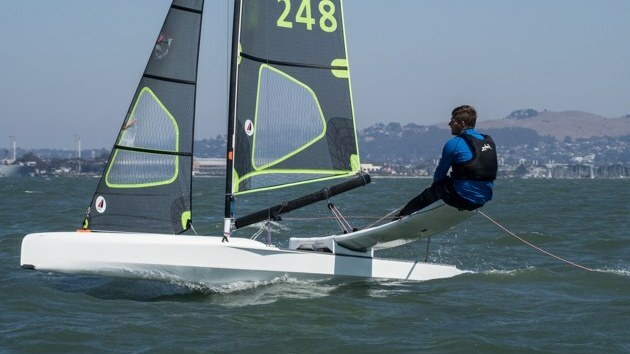 Clarksail - Sailing News Pages by Willy Clark. IC Rules 2009 (for interest only). Extracts from the Royal Canoe Club Rule book, 1910. Image: Robin Wood on his way to winning the 2008 Billy No Mates © James Close, JEC Creative. Image: "Chris Hampe at the 2013 Europa cup. 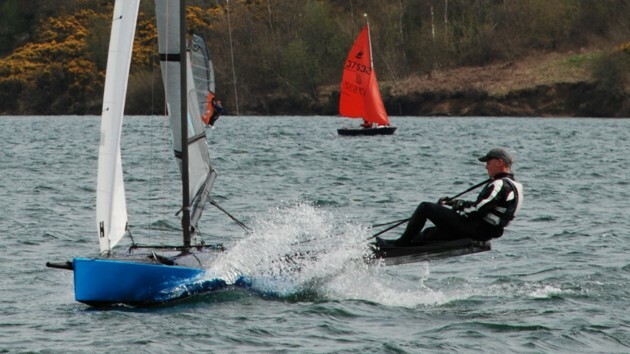 Photo: © Loch Lomond SC"
Image: "John Robson (GBR283) at the 2017 Worlds, Pwlhelli. Photo: © Robert Muller"
The Europa Cup was held as part of the 121st Travem�nde Week in Germany. 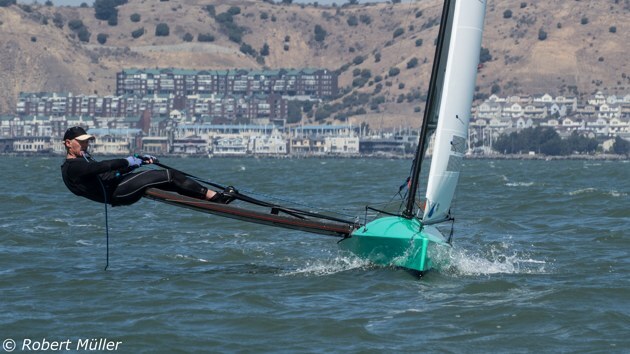 The opening day saw testing conditions with the wind varying from 20 to 25 knots, but it was the large and steep choppy Baltic sea that caught many competitors out resulting in many capsizes. Chris Hampe (GBR) dominated the first race leading all the way around the course unchallenged from Johan Elfstrom (SWE) in second place. In race two Chris led the fleet again, only to capsize on the final beat to the finish letting Johan through for the win. 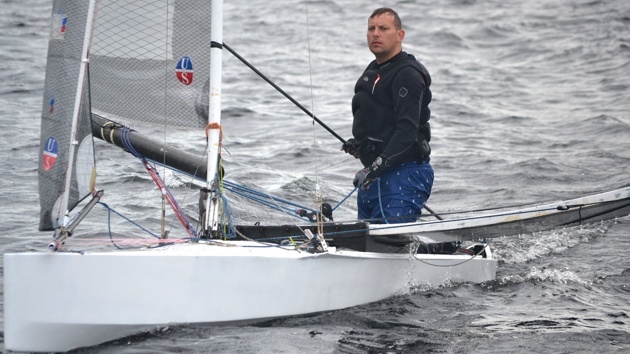 Axel Bierwagen (GER) was the only other sailor to finish both races as the conditions took their toll on the fleet. Day two and conditions were only slightly better, Hampe again lost the lead with a capsize on the final beat, and Johan who began to find another level of performance and recorded a 1, 2, 1 scoreline to move to the head of the leader board. 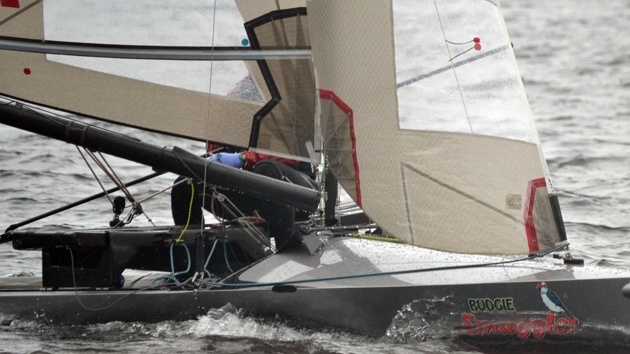 The new 2009 Rules boats were still struggling in the conditions, with Peter Ullmann the only one to record a finish, but was well down the order of IC One Designs. The home charge from the German fleet was hotting up as Frederick Steimann closed the gap on Axel for third. Day three and no wind on the course area forced the committee into a long delay until a sea breeze could fill in and stabilise. Racing eventually got under way at 1600 with wind varying from 12 to 18 knots with a moderate chop. Johan continued to dominate, winning all three races and securing overall victory. Peter Ullmann was able to fare better in his 2009 Rules boat to lead around the course whilst Roger Regitz was able to pace the front running ICODs. Axel had the second best day scoring 2, 3, 2 to assure himself of finishing in third. Behind the front two sailors racing was extremely close with boats separated by seconds. Chris Hampe had a disappointing first race of the day but improved in each race to secure second place overall. The final day dawned with no wind again and racing was abandoned at midday. Johan was a worthy winner making fewer mistakes in the windier races and having much more boat speed in the lighter sea breeze. 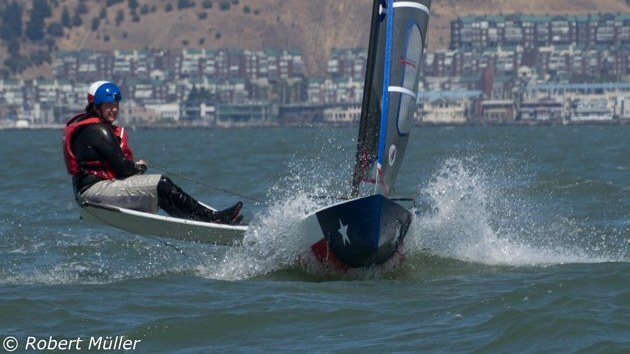 Chris was content with second place with some off-the-water problems taking his focus away from the sailing. Axel was third and best of the Germans. 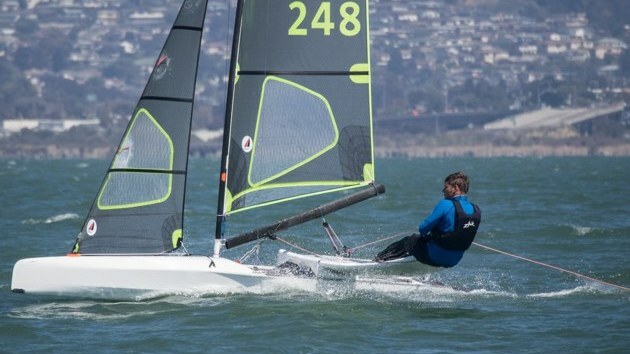 Image: "AC Class winner Robin Wood at the 2013 Europa Cup.. Photo: © Loch Lomond SC"
Image: "The mountains of the Llyn Peninsula behind, and Brett Holly (AUS1) at the 2017 Worlds, Pwlhelli. Photo: © Robert Muller"
Image: "International Indeed, Close Action.. Alistair Warren (GBR317), Chris Maas (USA246) and Peter Ullmann (GER79) at the 2011 worlds, Travemunde, Germany. Photo: © Robert Muller"
Image: "Great Spray Effects. Frederik Steimann (GER68) at the 2011 worlds, Travemunde, Germany. 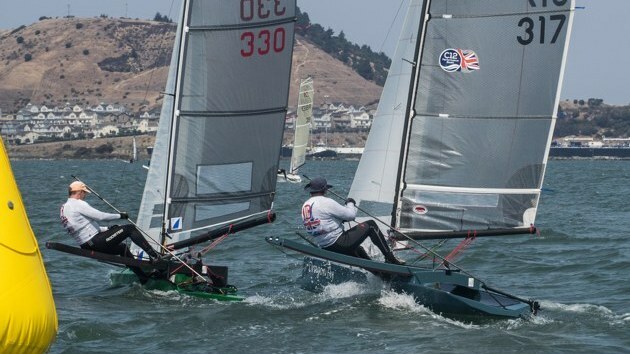 Photo: © Robert Muller"
Image: "Mark Goodchild (GBR265) at the 2017 Worlds, Pwlhelli. Photo: © Robert Muller"
Image: "Alasdair Alston (GBR196) at the 2017 Worlds, Pwlhelli. 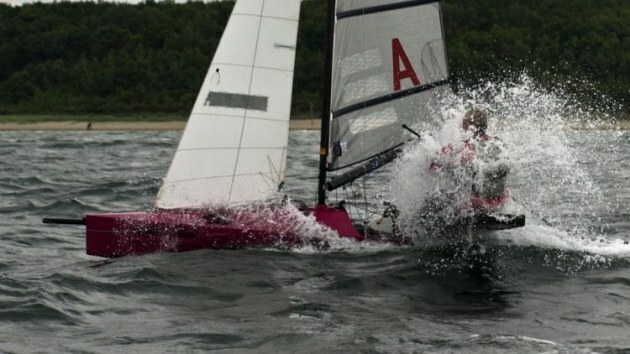 Photo: © Robert Muller"
Image: "Dave Timson (GBR303) and Rob Bell (GBR298) at the 2011 worlds, Travemunde, Germany. Photo: © Robert Muller"